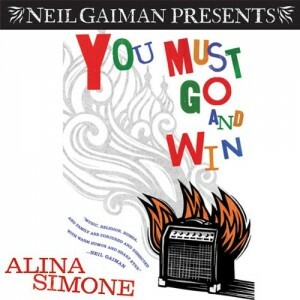 I’d never heard of Ukranian-born musician Alina Simone before Neil Gaiman added You Must Go and Win to his line of audiobooks on Audible, but the combination of her background and career piqued my interest, and a recommendation from Gaiman sealed the deal. It is perhaps a little strange that I listened to the book before ever listening to any of her music, but, luckily, her stories are compelling enough to stand on their own. The book consists of almost a dozen long essays largely focused on the intersections between Simone’s heritage and her tentative musical career. The stories are occasionally rambling, sometimes thoughtful or poignant, and almost always funny. Simone was a childhood friend of Amanda Palmer’s, and one chapter recounts their shared experiences as struggling artists right up until the point when Palmer starts finding success. My favorite story by far involves Simone’s absurdly terrifying experience at a Siberian strip show, where, to her horror, the male strippers pull more than willing audience members onstage and do unmentionable things to them. Simone is a relatable, down-to-earth storyteller, and her struggles with success are thoughtfully presented throughout. However, the most fascinating stories focus on her oddball fascination with Siberian religion and culture. For example, her idea of reading for fun involves diving into a dense tome about an obscure religious sect who believed that self-castration was the best way to purify the soul. She cheerfully suggests that women carry this book – Castration and the Heavenly Kingdom – as a defense against harassment after using it to scare off an overbearing Italian fan. Her obsession with the strangeness of Siberia was contagious, and I found myself wanting to know more about that faraway region. Although Simone does a good job keeping things moving with wry, self-deprecating humor and fascinating regional details, some of the stories feel like they are missing a through-line. I enjoyed what she had to say, but I wasn’t always clear how one anecdote tied into the next, and a few of her endings were more elliptical than revelatory. Additionally, the first story or two seemed like comparatively mundane horror stories about the life of a struggling musician, and I was initially worried the whole book would continue in that register. Overall, however, this collection of essays is a brisk, entertaining read, and an audiobook seems like the ideal format. I came away feeling like I’d learned a few things about Siberia, and I’d especially recommend the book to anyone interested in creativity and the arts.